MonoRab™ IHC Application Service New! MonoExpress™ Premium package uses protein as antigen, the gold standard when it comes to high-quality monoclonal antibody production. Protein antigens result in monoclonal antibodies against multiple conformational epitopes of the target protein, maximizing the chances your antibody will work for a variety of applications. To get started, simply provide your target protein sequence; we start with protein antigen production all the way to the production of application guaranteed monoclonal antibodies. MonoExpress™ Gold, Silver, and Bronze monoclonal antibody production services use peptides as antigens and all MonoExpress™ packages come with superior ELISA guarantees. Plus, you'll receive your antibody or hybridoma cell line 4 months faster than traditional immunization protocols. Application-Guaranteed: MonoExpress™ Premium guarantees at least 1 clone will work in your experimental system. Optimized immunization: Our advanced technologies - OptimumAntigen™ design tool, proprietary immunization technology, and new GANP mouse – increase specificity and affinity of antibodies. Worry-free: Our safety net policy means your mAb investment is protected. Fast turnaround time: We deliver antibodies 4 months faster than traditional immunization protocols. Certified facility: AAALAC International accreditation and OLAW certification demonstrate our commitment to responsible animal care and use. Protein antigens are the elite choice when it comes to high-quality monoclonal antibody production. Their unique ability to elicit monoclonal antibodies that recognize the native confirmation of the target protein makes them a superior choice over other antigen strategies. Our popular application-guaranteed MonoExpress™ Premium monoclonal antibody production package exemplifies the high success rate of protein antigens by offering the unprecedented guarantee that at least one clone will work in your own experimental system. + Additional clones may be purchased. The antibody generated by conventional immunization protocol had weak specificity to acetylated peptide antigens and cross-reactivity with corresponding non-acetylated peptide antigens. MonoExpress™ antibodies had high specificity to acetylated peptide antigens and no cross-reactivity with corresponding non-acetylated peptide antigens. Clone 1: Recognized dual phosphorylated peptide, single phosphorylated peptide 1, single phosphorylated peptide 2 and non-phosphorylated peptide. Clone 2: Recognized dual phosphorylated peptide, single phosphorylated peptide 1 and single phosphorylated peptide 2. Clone 1: Only recognized dual phosphorylated peptide. Clone 2: Only recognized dual phosphorylated peptide. Clone 3: Recognized dual phosphorylated peptide and single phosphorylated peptide 1. Clone 4: and Clone 5: Recognized dual phosphorylated peptide and single phosphorylated peptide 2. 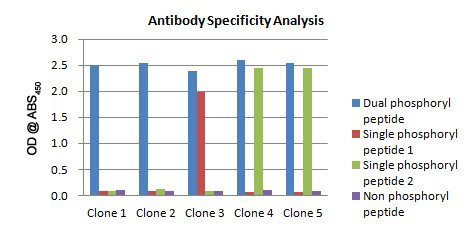 Affinity analysis of a monoclonal antibody generated by MonoExpress™ Antibody Services. 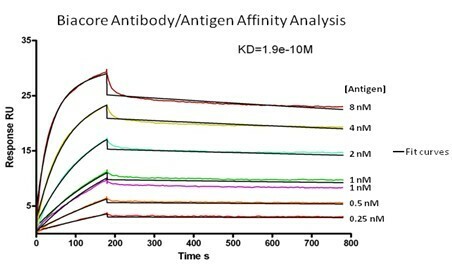 Biacore antibody/antigen affinity analysis showed that the MonoExpress™ generated antibody exhibited an equal or greater affinity to its complementary antigen, compared to an antibody generated by conventional immunization. 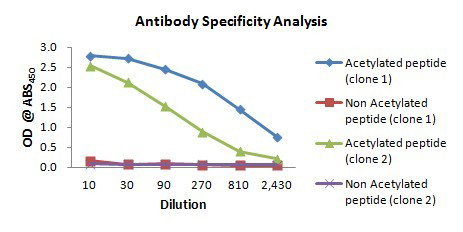 Typically monoclonal antibodies generated by MonoExpress™ services display reasonably high affinities to their target antigens. Cancel the project after the first delivery of supernatants and only be charged (applies to Premium (SC1711) and Basic (SC1717) packages). Purchase an additional 10 supernatants will be charged. If a successful clone cannot be found after the second supernatant delivery, customer may choose to cancel the project and will be charged plus the cost of the additional 10 supernatants (applies to Premium (SC1711) package only). For problematic antigens check out our DNA Immunization Service.